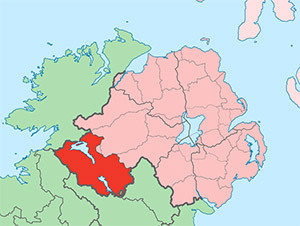 County Fermanagh (from Irish: Fir Manach or Fear Manach, meaning "men of Manach") is one of the six counties of Northern Ireland. Enniskillen is the county town and largest in both size and population. It is also one of the thirty-two traditional counties of Ireland, as well as part of the historic province of Ulster.